Links to all the departments in the state government. The Great and General Court includes a membership directory, committee information, current legislation, the Constitution, and a guide to the legislative process. The Legislative District Browser lets you find information on your House and Senate representatives. Includes membership directory, committee information, current legislation, the Constitution, and a guide to the legislative process. Find your legislator here. Comprehensive list of MA branches of government, Constitutional offices, and the departments under them. 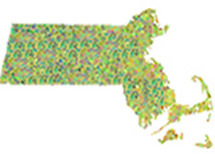 Provides maps, histories, practical guides to living in MA, and more. Also see this county and town directory. From the Census Bureau. You can also find county and town statistics on this page. The Boston Public Library has a comprehensive collection of city of Boston and Massachusetts state documents. Search in their library catalog. From ALA GODORT; links to databases produced by various state agencies.